Sam Lee Laundry was one of the two most common names, the other being Sing Lee, for Chinese laundries judging from business directories. “Sam Lee” actually refers to a concept that can be loosely translated as “threefold profits” and not as the name of the proprietor of the business. However, many customers would assume it was his name and the Chinese laundryman would get ‘stuck’ with that name and use it instead of his real Chinese name which, being unfamiliar to non-Chinese, was harder for customers to remember. 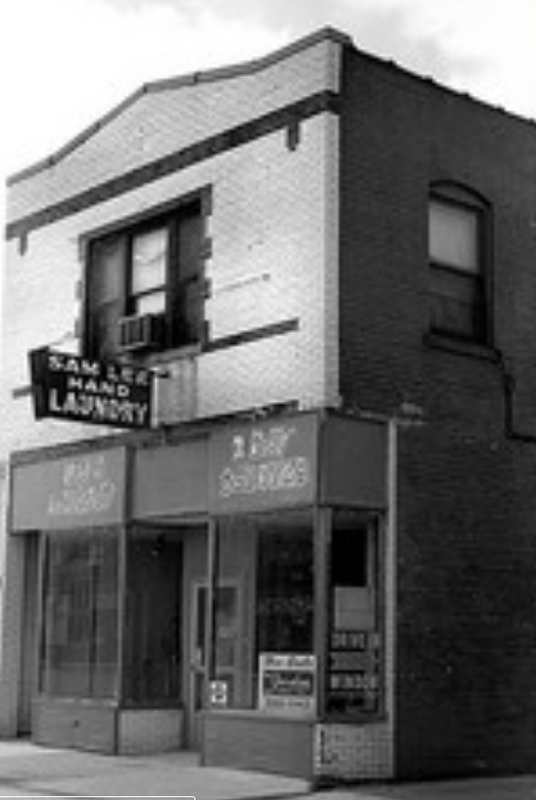 The Sam Lee Laundry in the above photograph taken in around 1975 in Champaign, Illinois, may have already gone out of business as did many Chinese laundries due to competition with large white steam laundries and the widespread availability of home washing equipment. A For Sale sign is visible in the window, and the store ‘looks’ to be empty, notwithstanding the “OPEN” sign on the front door. In any case, by 2008, this building at 213 S. Neil Street definitely was no longer a laundry even though the building still stood, even if barely, as evidenced by this comparative ‘then and now’ photograph posted on Flickr.com. Out of curiosity, I checked census records identifying Chinese living in Champaign, IL. in 1920, there was a Chinese named “Sam Lee” at 109 S. Neil Street (the building in the photos was identified as being at 213 S. Neil, but it is conceivable that the city renumbered buildings at some time and that the two addresses could have been the same building) who had a Chinese partner and 3 Chinese lodgers. All were listed as laundrymen (not shown in the truncated census record sheet). Unfortunately I could not access the 1930 census and in the most recent 1940 census (records are sealed for 70 or maybe 73?) years), the laundry had changed hands with different owners. 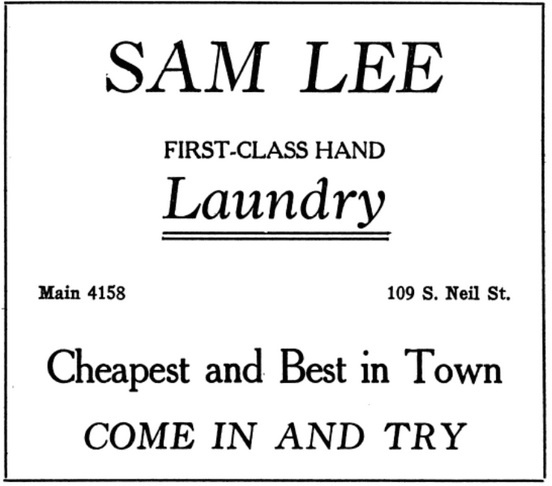 Sam Lee had an interesting claim in his 1920 ad in a University of Illinois Chinese student publication, Young China, for his laundry, “Cheapest and Best in Town,” that suggests he quickly assimilated to American promotional hype!